Bivouac was founded in 1970 by Ed Davidson while a senior at University of Iowa. In 1971 Ed left Iowa City and opened the Ann Arbor store. 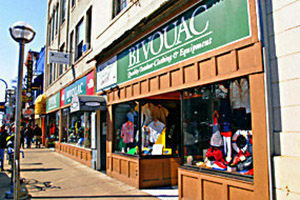 Originally Bivouac was an army surplus store and has since evolved to sell a unique mix of Men’s and Women’s clothing and top-of-the-line gear and outdoor equipment. Bivouac features an extremely experienced and knowledgeable staff and offers a broad array of services such as shipping, rentals and repairs. The goal of the store is to match the customer with the right product for their needs. And to answer the most asked question of all… “Bivouac” means temporary campsite and can be used as a noun or verb.